NEW! Are you a volunteer Firefighter? Then of course, the joy of seeing it all again as I do my husband's return. The bright spot is that we end up with a modest return. Anything in the black I'll take as a win. It's a weekend of birthday boys young and "hey 31 is still young!" should be an interesting contrast in celebrations. Hope you've got something to celebrate this weekend. I prefer WIP to UFO (UnFinished Object), mostly because the former just sounds a bit more promising. These are about the size of a penny and on my work table today. That photo is in situ, it's just a peek afterall. I have a few different ideas I'm working out in these ones, and they are on the thin side, so some roadtesting will be in order. One of my favourite qualities of polymer is that you are never done until you say so. This is raw state, but if I bake and then decide to add more clay, I can repeat this cycle over and over. That is a wonderful thing! Right now I'm picturing doming the ones with three holes and leaving the ones with two flat. I like the rustic lean they are taking so some burnt umber may be in the future too. I'm brand spanking new to blogging so please bear with me. I've followed the Art Bead Scene blog since the start. Well, technically, I can remember finding it when it was maybe a few months old and promptly reading every post until I reached the start. There have been many times over the years when I had almost had things together enough to participate in the monthly challenges, but somehow it just never happened - until today! After my last birthday I set a somewhat vague goal of really establishing my online shop etc. A few days later I see the April ABS challenge and it was like it was made for me. Cool slate blues are where it's at. So I took on the inspiration piece and the time line as a good deadline for getting things in order. I'm a polymer girl so I got straight to the mixing. I came up with the saturated slate blue as a starting point and from there added a few translucent versions, a few greys, purples, greens and a buttery yellow (cold butter that is) and I had my palette. (If I were an experienced blogger I'd stick a nice shot of my sheets of blended clay here...next time). I had the daffodils in mind but really I ended up with abstract poppies, which I prefer. Here is the largest pendant I came up with which didn't actually become a full piece of jewelry just yet. Not to worry though, I made a whole bunch so I could get choosy once I set to making the jewelry. I ended up with three necklaces, and a whole lot more beads waiting for their chance. Funnily enough my favourites didn't speak to me in a design at all so I'll have to let those hang around a bit in my mind. Here are my finished pieces! I had such a great time getting these together from start to finish. The best part about polymer is there is still so much more mixed clay all ready to make more complimentary beads. Although I still have this stack to work through. Thanks so much for checking out my new Internet home! ps one bit of housekeeping - in case you were wondering- I have been around on blogger, flickr and etsy as FrankandRox since 2007. But I thought I would start fresh with my new brand: A Polymer Penchant. I hope you will join me on the journey. The way Oprah would say it. It's stuck in my head now as the only way to start this blog. Just so you know there won't be any free cars, sorry. 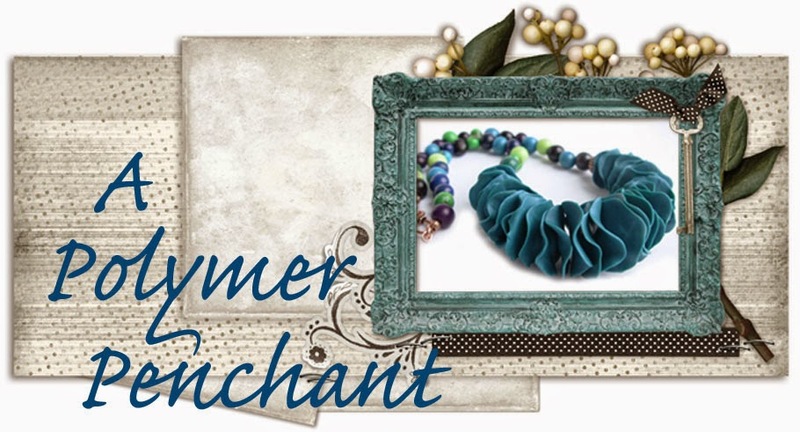 There will be handmade polymer beads and jewelry, inspiration and process. There will likely be pics of my almost 2 year old girl, since who can resist? There will be lots of me trying to learn how to use all those fabulous online tools. I've been watching everyone else growing their online businesses for so many years now from the sidelines. I love watching the success, don't get me wrong, I just really need to join in the fun. I've had a case of the "if I can't do it perfectly, I don't do it at all" - it is time to outgrow that thinking. So here I go, jumping in with both feet.